If I had known the impact this book would have on my life, I would have read it the day my friend suggested it to me. She gave me the perfect solution to a problem I didn’t even know I had. Needless to say, I’m forever grateful for this book and reread it every year. It has helped me become the leader I am today, and I recommend it to almost everyone I meet. So, today I’m recommending it to YOU. 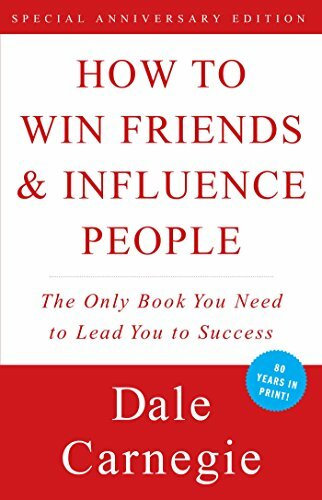 It’s called “How To Win Friends And Influence People,” by Dale Carnegie. First, this book is not an “easy” read. You’ll probably find hundreds of new words, expressions, and idioms that you’ve never heard before. Meaning, if you don’t have an advanced level of reading comprehension, you should read this book in your native language. Even I found new words the first time I read it! And that’s probably because the book was originally published in 1936, and lots of the words are no longer part of everyday speech… because, well, languages evolve, remember? …the author proposes such thought-provoking ideas that you often have to read the same sentence multiple times just to reflect on its meaning. Next, don’t worry about looking up every new word in the dictionary. Doing this just distracts from the message of the text and –more importantly– it’s tedious, boring work! Finally, I suggest purchasing a physical copy of this book so you can highlight and underline important ideas. I love taking notes directly in my books, and I put *stars* by things I don’t want to forget. This is a book everyone should own, read, and study. I know you want to improve your English, and that’s why I’m recommending it to you. The communication skills it teaches are a million times more important than “perfect” grammar and “native-like” fluency– COMBINED. So, if you care about having better relationships, being a leader, and leading a successful, happy life… then read this book! And after you read it (or if you’ve already read it), tell us what you learned in the comments below. I also read before. And do agree, the book is really awesome. Though some of the concept are really hard to implement in real life, but overall it’s good. I also read this book when I was young. Truly i was looking for a book like this because i was managing our farm and a tough job to deal with people. I thought would be great if i could find a book that helps me with human relationship. It is very interesting (still) we take human relationship for granted. But rarely pay attention to it. but which is not least important in anyway. the first lesson l learned from this book was blaming has no value at all. you cannot change people by blaming and his striking example of criminals who never confessed but defended themselves and blamed back people who accused them. This drastically changed how i then deal with human relationship problems. in carnegie’s word they are not techniques he has put it on the book but a way of living he tries to convey. Great you recommend this book for English learners. I already read that awesome book twice in Portuguese (I’m from Brazil) and one in English. The course and the book are really great!!!!! They changed my life for the better. Some years ago I found out about that greatest book and, of course, read it in the native language. That is a kind of book should reread again and again. It written so simple and easy at least in my native language that some people find it not enough serious. Such a feature holds them back from understanding the main thought.